The rent at Griffin Court Community Office Apartments ranges from $560 for a one bedroom to a $1,375 two bedroom. Apartments in this building are about 11% more expensive than the Moorhead average. This is a cat-friendly apartment. 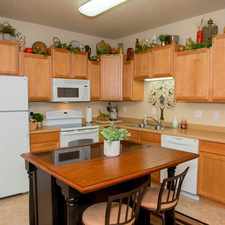 Griffin Court Community Office Apartments has a Walk Score of 30 out of 100. This location is a Car-Dependent neighborhood so most errands require a car. There is no shortage of variety within the Griffin Court Apartment Community. With five different properties, you're sure to find an apartment to fit your lifestyle. Whether you're looking for a cat or dog friendly townhome, or an affordable one bedroom with a garage - there's something for you at the Griffin Court Community in Moorhead, MN. Explore how far you can travel by car, bus, bike and foot from Griffin Court Community Office Apartments. Griffin Court Community Office Apartments is in the city of Moorhead, MN. Moorhead has an average Walk Score of 32 and has 38,065 residents.